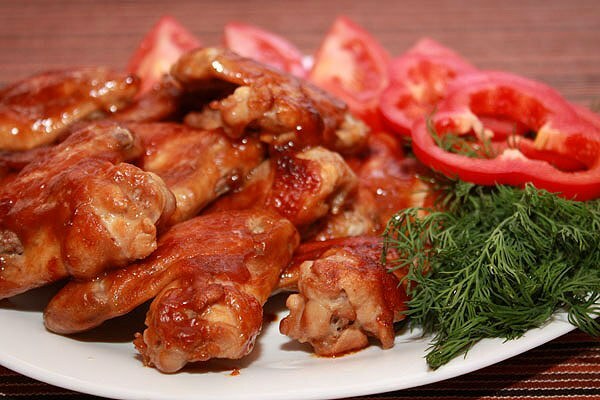 Crispy delicious chicken wings great as a snack or a hot meal. To cook them pretty easily and quickly, this dish can be used as a treat for unexpected guests. Special ingredients are required, the components of the marinade can easily find in the fridge. Rinse the wings and fill them with marinade. For its preparation you will need 200 ml of soy sauce, one tablespoon of honey and one pod finely chopped chili pepper. Mix all ingredients and pour over the wings so that they were completely covered with marinade. Soak them for half an hour. While the wings are marinated, prepare the breading. Mix two egg yolks with two tablespoons of butter. Grate it finely 100 grams of hard cheese and add to egg-oil mixture. Place breading mix in a microwave for 10 seconds, one should be homogeneous. Roll each wing first in a cheese-butter-egg mixture, then in breadcrumbs. Next, they need to prepare, for those who do not like fried foods, use the method of roasting using a microwave oven. Set the mode to grill, place the wings on a grate and cook for 20-25 minutes. You can cook the wings the traditional way. Heat a deep pan and pour a vegetable oil, not less than 100 ml. When the oil is warm - dip the wings first in a cheese marinade, then roll in breadcrumbs and place on the pan. Fry them until Golden brown on both sides. Then remove them and place on a paper towel to get rid of excess fat. If you don't like fried foods, cook wings in the oven. Heat it to 180-200 degrees, put the marinated wings on a baking sheet and bake for 20 minutes. If you want to get a crispy crust, leave the tray open. And if you prefer softer meat, cover the baking sheet or pan with foil. If desired, in the process of cooking you can pour the dish is eye-catching juice. Serve the finished dish as a snack to beer or wine, and the second with a side dish of vegetables or cereal.